A thriller and this is the expectation I feel will be met with gusto. The time frame is less, the enemies number many and the heroes few. This book will be something that keeps me glued to it without sleep. I can just tell, and I can't wait to get started. Fast paced, action-filled and brilliantly narrated, Matthew Reilly doesn’t let one down in expectations. The most recent in the series, Scarecrow and the Army of Thieves was one I found on the shelf of Reliance Timeout and post haste borrowed it from the library that evening. The story begins with the detailing of seven incidents that occurred on seven specific days that brought about the formation of the group of villains named The Army of Thieves. It also shows that the next incident would happen the following day. The Army are then shown to have taken over a fortress, an island near the Arctic circle called Dragon Island, where they have enough men and weapons to hold off any team that comes at them, since there is only one side of the island facing land. The world needs to be saved in five hours. The men tasked with the mission are a group of Navy SEALs led by a man Ironbark, and a small marine team, with four marines and three civilians, led by Shane Schofield, call-sign Scarecrow. When Ironbark decides to go ahead without analyzing the situation and egoistically tells Scarecrow to not interfere with his team, it brings about their downfall. 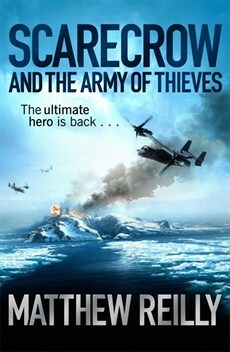 While Scarecrow and his team go to the site of a plane crash from where an SOS call first alerted them about the Army’s island takeover, Ironbark’s team foolishly rush the island where they are overwhelmed and executed, with gunshots, their screams and voices of panic echoing through the headsets of Scarecrow’s team. This leaves our protagonist Shane as the only person who can save the world. In between all this, Scarecrow finds himself battling yet another person who is after his death, a French soldier who is known as Renard (later shown as Veronique Champion). Trusting that the world is more important than his life at that time, he enlists Renard and her team of two, Dubois and Baba into his team to try and stop the Army of Thieves. Meanwhile, in Washington, cryptanalyst David Fairfax of the DIA finds himself helping Scarecrow again, and getting into trouble again as he tries to save his colleague Marianne Retter from getting kidnapped. Scarecrow does damage, and serious ones at that, determined to make the impossible possible as he also eliminates villains without regret. We also see a new character, one that would bring a smile to your face when you read about him, his loyalty and will to find Scarecrow and battle by his side. Yes, Bertie would do that, as would most of the other characters. There are twists that catch the reader off guard, but some that seem quite predictable too. The thrill factor in the novel is such that I could not put the novel down, and finished the book in some hours, even managing to steal in a few minutes when my boss wasn’t in the vicinity. There is bloodshed aplenty, with secondary characters dying for the world saving cause, and the villains torturing our heroes, trying to get a step ahead of them and not let them stop the tyranny and anarchy that they want to let loose on the world. Reilly adds tension with incidents trying to turn Scarecrow’s own team against him, and create doubt. Scarecrow gets respect for his bravery and loyalty from unexpected sources as well. We fall in admiration for characters we would want to see again in the next novel. I’ve read almost every one of the books where Shane Schofield is the protagonist, and he battles against enemies that are absolutely unbelievable, yet give a sense that it could happen, or what if it did? It’s something that makes people sit up and take notice. This latest addition was every way as good as, if not better than the previous three novels of Scarecrow, and it makes me want to read it all over again. This is a thriller in every respect of the word, high octane action and Matthew Reilly at his devastating, magnificent best. Awesome ! I so loved this. Nimue, it is a brilliant book I feel :) Do read when you can and add on your thoughts. Aah Mathew Reily... I've read a few books of him. Mathew and Clive Cussler are my favorites when it comes to action and adventure. The heroes are definitely likeable. Haven't read this one yet. But will now.